The first is something you need to pay a little bit of attention to, in order to prevent damage to the ESP GPIO pin. It’s very easy to isolate your ESP8266 from the WS2812 5v supply voltage and provide a low impedance drive for the WS2812 bus at the same time, using a cheap, PNP transistor in emitter-follower configuration. An emitter-follower is a non-inverting buffer, which provides a medium to high impedance on it’s input (so it doesn’t place any significant load on the GPIO pin) and presents a low impedance output (meaning it can drive more current than the ESP GPIO pin can alone). Unlike the more traditional common-emitter transistor circuit, the emitter follower doesn’t amplify the input signal at all; in this circuit it is acting as a switch, but while the output from the GPIO is switching between 0v and 3v3, the output of the emitter-follower is switching between 0v and 5v. Thus this simple circuit not only protects your ESP from damage, but also provides the correct voltage swing for the WS2812 data bus, too. 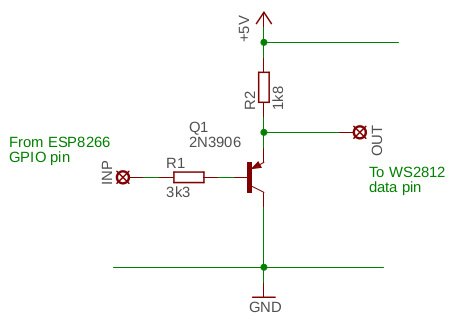 Almost any common, small-signal PNP transistor (2N3906, BC560) will work in this configuration; specific type is not too critical. The second issue is the common watchdog-timeout issue which plagues applications which spend too much time in tight, time-critical loops without allowing the ESP8266 time to attend to its WiFi housekeeping. The answer in this case is fairly simple …just put a couple of calls to yield() into the code in strategic places (one in the top of the loop function and another following the call to showStrip() , in whichever example code is being used, worked well for me). Unless you’re doing something insanely complicated and insanely fast, you shouldn’t notice any visible difference to the display. If you are running something i-comp and i-fast, you should bump the ESP8266 speed up to 160Mhz to handle it, anyway (“board_f_cpu = 160000000L” in your platformio.ini file); you don’t need to make any changes to the code to handle the faster CPU clock. With these two issues addressed, you should be able to run any of the examples from the Tweaking4All site. You have the choice of using either the FastLED or NeoPixel libraries and the Tweaking4All collection comes with all of the examples duplicated across two directories, one for each library. There’s also a second version of the FastLED library available from Cory R. King which adds DMA output for the ESP8266 for a smoother, flicker-free output. Note that DMA hardware in the ESP8266 uses pin-3 (which is the UART RX pin) as the output …so no matter which pin you define in the display code, it will always use pin-3. In addition to those already mentioned above, Makuna (Michael C. Miller) has also done a lot of work on optimizing WS2812 driver code specifically for the ESP8266 and ESP32 processors with his NeoPixelBus library. It has multiple interfacing options (DMA, UART and bit-bang) available. DMA is the default (and recommended) operating mode. Users have reported that, for the ESP8266, the NeoPixelBus library is the most robust and reliable method for driving addressable LEDs when the WiFi must also be in use. Although Michael’s examples are quite comprehensive, you may find yourself with some coding to do if you want to convert all of the Tweaking4All demos to run using this library.